From quaint little shops to multi vendor malls, throughout the United States people love to go antique shopping. The following article takes a look at nine areas of the country and highlights the antique stores in those areas. Spend the day antiquing in beautiful Park City, one of the two most famous resort areas in Utah. Park City is home to The Silver Queen Antique Co-op, 333 Main Street. From there take a beautiful scenic drive to Hollyhock Antiques located in Midway just south of Park City. For a special antiquing experience visit Salt Lake City, only 23 miles from Park City. There you will find many wonderful antique stores including Brass Key Antiques, Cobwebs Antiques and Collections, The Antique Shoppe and Gingerbread Antiques. Throughout Idaho antique shops dot the landscape of small towns and big cities. The following is a sampling of these unique shops. Antique World Mall, 4544 Overland Rd., Boise, is a multi dealer mall with over 100 dealers. From Smith River to San Ysidro, California spans 770 miles in length. Throughout this magnificent state are hundreds of antique shops nestled in mountain towns, clustered in tourist areas and scattered throughout cities. The following are resources for finding antique shops in California. A popular California antiquing area is Old Town Orange where many tourists from other countries come to shop for antiques. Beach California has a comprehensive listing of the many antique shops in this area. Click the link and scroll down to the list. 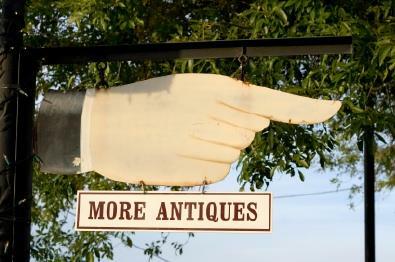 Antique Trip has an extensive list of antique shops located throughout California. Enjoy the majestic beauty of the mountains, the rich history of the area and the feeling of going back in time, as you browse through the nostalgic antique shops of north Georgia. Nestled in the historic mountain town of Braselton, The Braselton Antique Mall is home to 56 antique dealers. Housed in a refurbished 25,000 square foot century old building, dealers offer a variety of antiques and items crafted by local artisans. Just a few miles away in Hoschon are the Antique Station and Ye Olde Station, which specialize in gas station paraphernalia. Chamblee Antique Row, Old Towne Chamblee. Rector's Antiques and Wardrobe, 2201 6th Ave.
Beauty and the Beast Antiques, 745 St. Helens Ave.
Ethel's Eclectibles, 1623, 152nd St.
Kathy's Antique Mall, 406 E 26th St. Experience southern charm as you explore the antique shops of this beautiful town located on the bluffs high above Mobile Bay. The following antique shops are located in this picturesque city. Betty Haynie Antiques and Fine Art, 15 North Section St.
Fairhope Find, 52 South Section St.
Magnolia Pearls Antiques, 212 Fairhope Ave. Historic District Antiques, 539.W. McDowell Rd. Brass Armadillo Antique Mall, 12419 N. 28th Dr.
Big Easy Antiques Mall, 9201 N. 29th Ave. Antique Gatherings, 3601 Indian School Rd. The Antique Gallery, 1805 E. McDowell Ave. The scenic village of Waynesville is known as the antiques capital of the Midwest. With many of the town's antique shops housed in historic buildings, you get the feeling of being back in the 1800s. . The following Waynesville antique stores, with the exception of Village Antiques, are located on Main Street. Experience the ultimate antique shopping trip with an escorted tour of New York City's finest antique stores. Susansez NYC Walkabouts offers customized tours NYC. She will show you antique shops where the rich and famous shop. New York Tours offers escorted shopping tours of the SoHo, Nolita and Uptown areas of New York City. Family in New York will take you on an escorted antiquing adventure in New York City. Whatever part of the country you live in or visit, antique shopping is a great way to spend the day. Chances are you will find a treasure from the past that will look wonderful displayed in your home.